This beautiful, conveniently located unit is on Main Street in downtown historic Frisco. Frisco is an 1880’s mining town surrounded by the majestic Rocky Mountains and on Lake Dillon. Frisco is in the center of Summit County’s downhill ski areas: Breckenridge, Copper Mountain, Keystone & Arapahoe Basin are only a short drive to Vail & Beaver Creek. Some of the best cross country skiing can be found at the Frisco Nordic Ski Center and for those more adventurous, we are just a few blocks from mountain trails. Of course there are outdoor activities all year round, including the Ten Mile recreational trail, which has over 50 miles of paved path, used year round, that stretches from Vail to Frisco & Dillon & from Keystone to Breckenridge. There is boating on Lake Dillon in the summer, special art and musical events all year round. It’s an easy drive from Denver to Frisco and whether you drive or take other transportation, you’ll never need a car once you arrive. The unit is located within easy walking distance to restaurants, coffee shops, stores, and only one block from the Summit Stage that offers free shuttle service to the Summit Ski areas and the Silverthorn Factory Outlet stores. 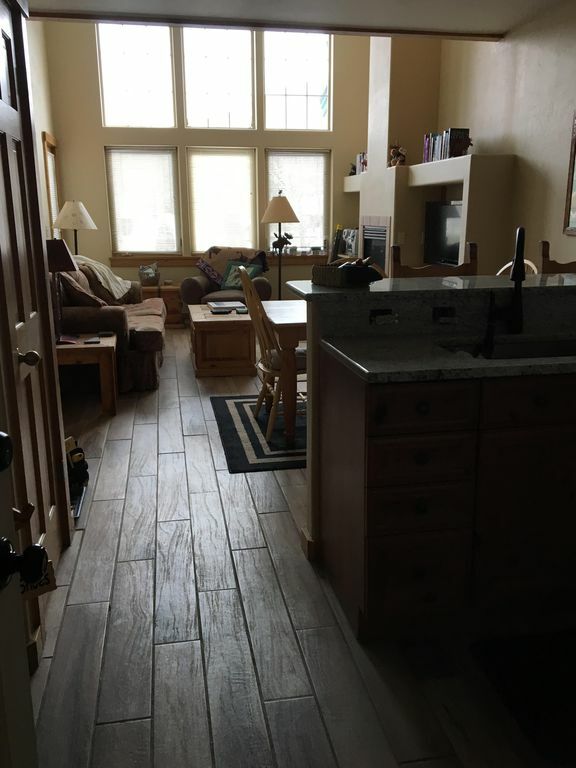 This newer built unit (1998) is nicley decorated with beautiful and comfortable furniture to help you feel relaxed and able to fully enjoy your Rocky Mountain experience. There are large windows and views of the mountains and the town - it’s located across the street from the Frisco Historic Park. The master bedroom has a queen size sleigh bed with a deep, extremely comfortable mattress, and there is a full private bath with a Jacuzzi tub. The living room has a comfortable sofa that converts to a queen bed. There is a second bathroom with a shower. There are even heated floors throughout the unit and a gas log fireplace to help keep you comfortable. We even provide natural fiber linens and allergy free pillows. This is a non-smoking unit. The complex is small and quiet. No pets. Contact: Linda or Don at the phone numbers listed or e-mail as listed below - keys and additional information (maps, transportation choices etc.) forwarded after reservation confirmed. My name is Linda Wagner and my husband is Don Wagner. We are retired and enjoy many actives, including skiing, bicycling, hiking, kayaking, traveling. entertaining and the arts. We enoy spending time in Frisco and all the natural wonders and activties the area has to offer. Don is a retired Attorney. I am a retired Registered Nurse and CPA..
Nice place in a cute town! Very well-appointed condo, reasonably priced, right on Main Street for easy dining and shopping. We had a wonderful time in your beautiful condo! The location was perfect ! We loved waking up and walking next door for breakfast ! The views were beautiful! We especially enjoyed the candles and fireplace in the evenings! Very cozy! No car needed! Location and condo were perfect! Lisa G and Brian W.
You can really tell when an owner cares about the experience! My teenage son and I were lucky enough to stay here during a recent three day father-son ski trip. This condo could not have worked out any better for us! 2 full baths with a one bedroom and a fold out sofa bed was the perfect setup - we could have stayed here a month! The kitchen was well stocked with everything we needed, and there was a pantry with herbs, spices, hot sauce, etc. We would stay here again, no doubt. If this place is on your list, book it - you won’t be disappointed! I appreciate your comments and gad it worked so well for you and your son. We thoroughly enjoyed our stay here. We have been skiing at Copper and renting condos in Frisco for years. This is a very modern condo with all the amenities right on Main Street. We have never seen a condo so well stocked with the extras - even K-cups for coffee and a new toothbrushes if you forgot yours. The owners are fantastic! I left my iPad at the condo and they arranged for friend to bring it down to Denver for me. The place was perfect - it was clean, well stocked, and the owner was very communicative throughout the whole process. It was very convenient to multiple mountains while right in the center of Frisco. I would stay again! Great place to stay in Frisco! We love this condo. It is roomy with two full baths. Great for a couple. Large windows overlook the museum, park and Main Street attractions. Walking distance to great restaurants. Only half a block to Summit Stage bus stop. The kitchen is modern and and well equipped. There is assigned parking. It is also quiet. We have stayed here three times (twice this winter) and hope to return again next year!